More details! I’ve added some framing added to the windows: trimming matchsticks down to roughly the right size, and then sanded the ends until they fit into place. 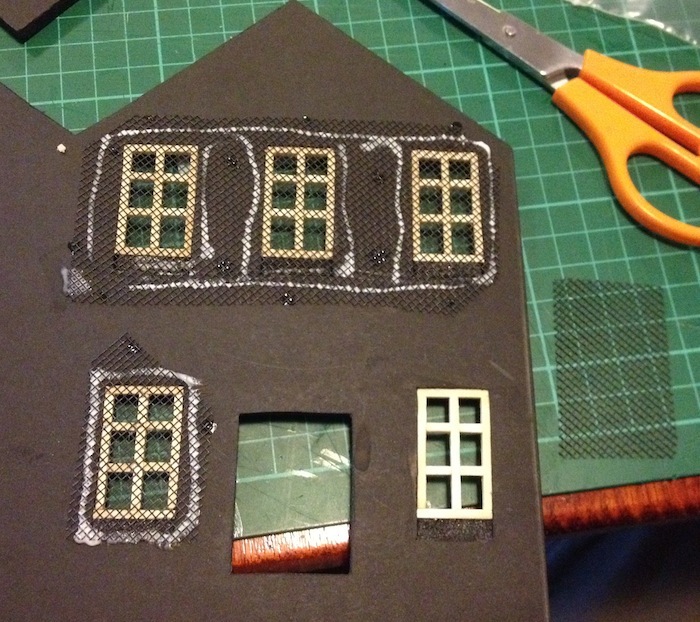 These have been attached with PVA, which will probably be more resilient than the matches themselves..
And beginning to add some nylon mesh to the inside of the windows (intended to look like the windows are made of many small glass panes). I’ll pick this out in silver when the building is painted, and will put some black paper or card on the inside. It’s been ages since I got to do any work on the table, but things have started up again over the weekend – I’ve reduced my work hours over the next month, and have (hopefully!) finally started to recover from a few weeks of illness. I have now added the retainer walls to separate the low and high ground, and built some stairs to connect the two. When I realised how big the stairs would be, I decided to break them up into two short flights + flat areas large enough for a 50mm base. That way, there will be less confusion over where a model actually sits: each section of stairs only runs for about 1″, and it’s now possible to sit a model halfway up. Next up: finish the ground texture, and move on to the buildings. 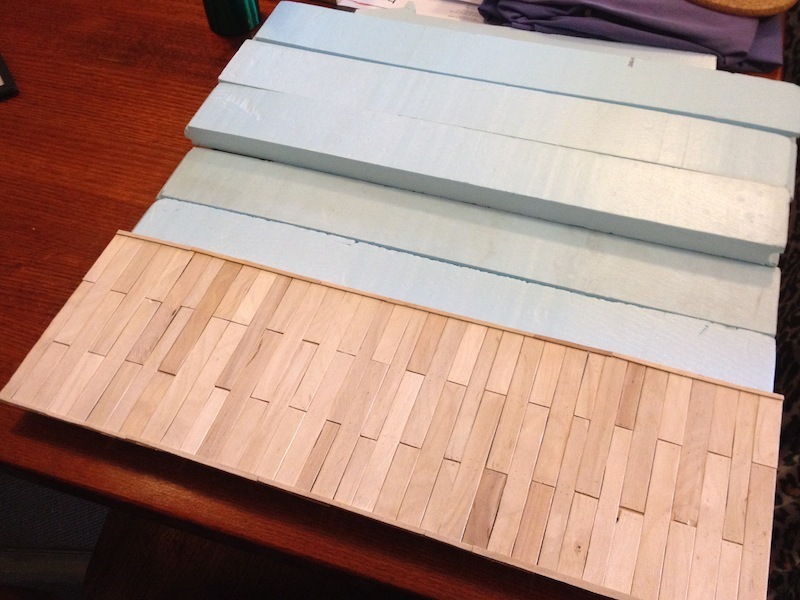 I’ll try out a few ideas for the dock, too – it will eventually be glued down onto the edge of the paving shown in these photos, but needs to be kept separate for now so that I can paint and texture the water areas. 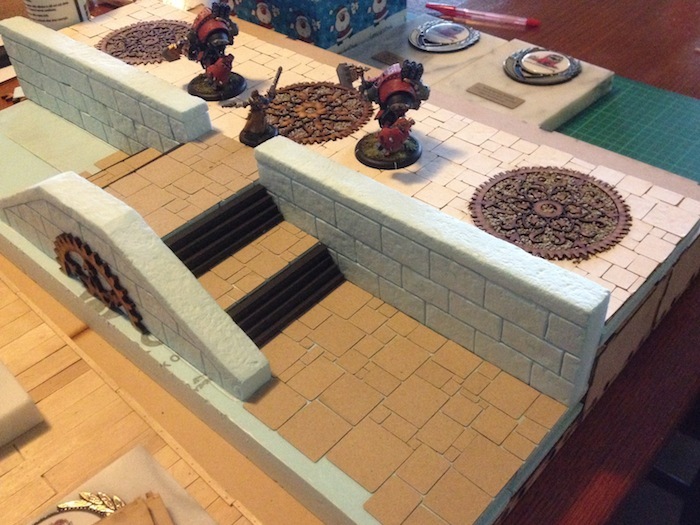 I’ve decided to cut out flagstones for the upper and lower ground levels by hand, inspired by Psycosm’s awesome Malifaux table on WargamerAU, and Pete the Butcher’s city board on the Privateer Press forums. 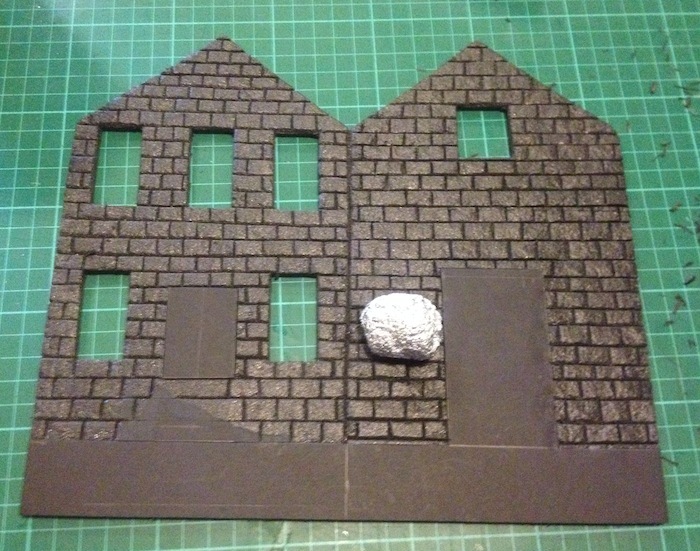 I’ve tried a few test pieces of road using the blue foam, and while it holds a cobblestone texture very well it’s just a bit too soft for a horizontal playing surface that will have metal figures on it. 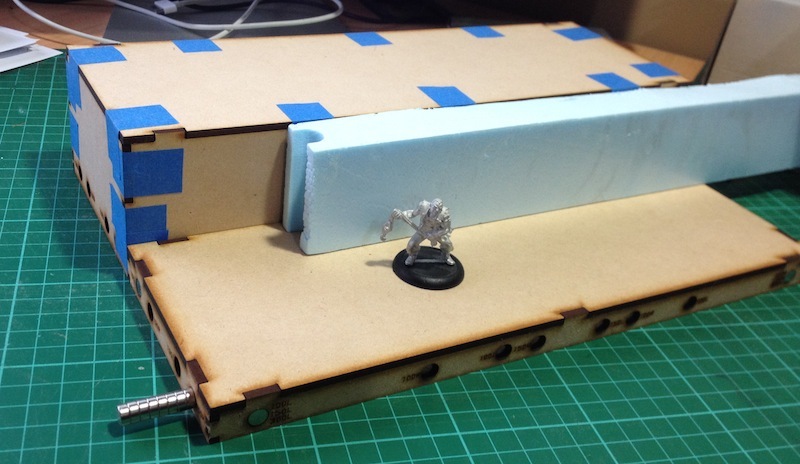 I learned my lesson a few years ago when I made a shallow water terrain piece using the one-part Woodland Scenics polyurethane water – it stayed slightly soft, and after a metal Leviathan was parked on it during a game the swamp retained a base imprint for almost two years… I’ll use the textured foam surface for walls, stairs etc, but will go for something more hard wearing for the surfaces that have models sitting on them. When I get a chance to go through my old No Quarter magazines, I vaguely remember seeing this technique used on one of their terrain pieces. After the flagstones are glued down, you can paint a thin layer of PVA on top to seal them – and then sand the whole lot back a bit once the glue has dried. That smooths them out a bit, and removes incongruous-looking point edges on what should look like a well-worn road. I also found four of these stashed away in my box of random modelling gear, bought on a whim in an earlier order from Back 2 Base-ix… I think they’ll work well for breaking up the street paving a bit, and adding some more detail. It’s all too easy to end up with large slabs of bland repetition that prevent you from seeing the scale of a large terrain piece. 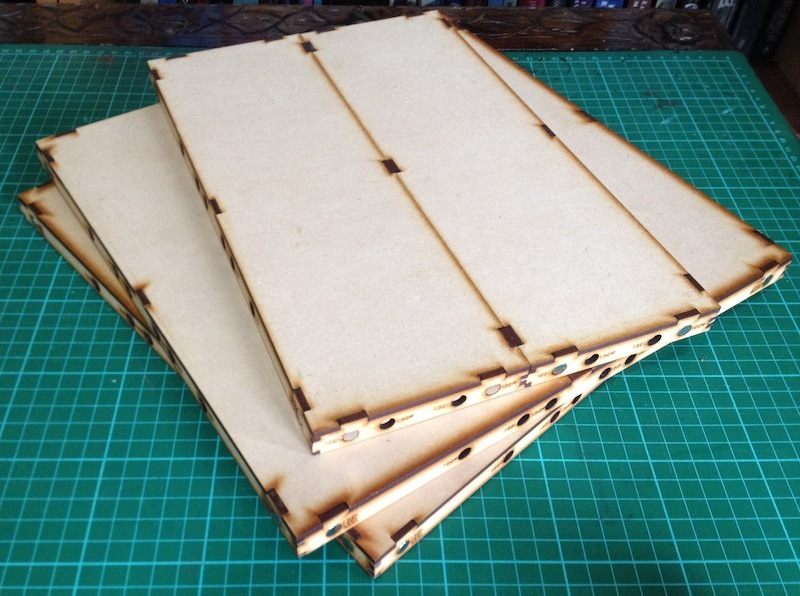 At 3mm (cut from MDF) they’re a bit too thick to just sit on top of things. 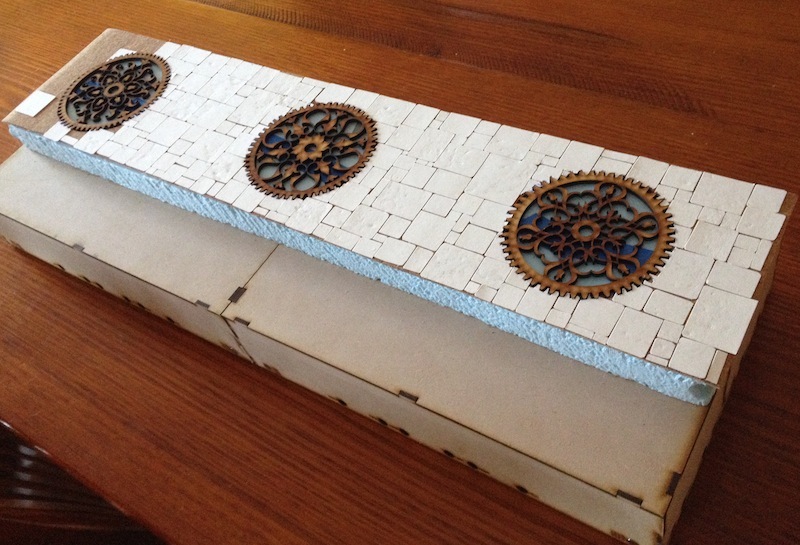 I picked up a roll of thin (2.4mm) cork sheet from Riot, and it looks pretty much perfect for raising the road up to match the ornamental gears. The picture above shows some holes roughly cut through the cork, testing out the idea. 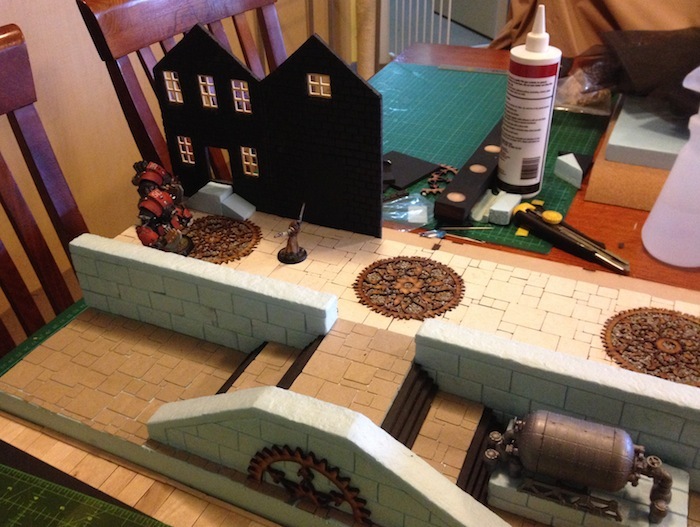 I’m planning to add some fine gravel or model railway ballast to fill the internal detail up to road level. The dock is still going to be the largest flat area on the table, but I’m hoping I can break it up a bit with scatter terrain and some uneven, weathered painting. 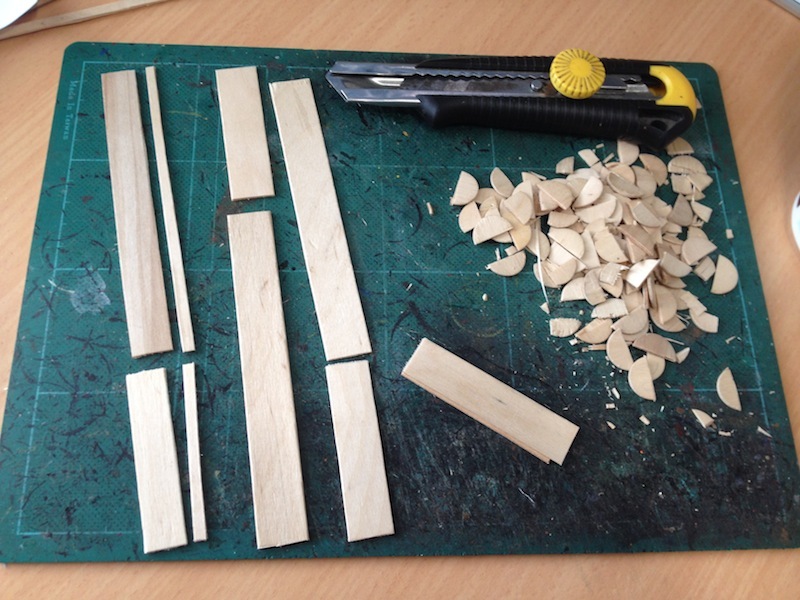 Remember those offcuts from earlier? I used them on the upper surface, helping to sandwich the edges in place. 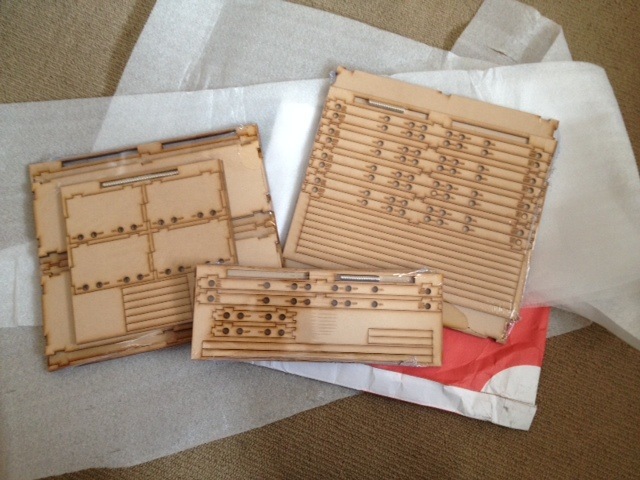 It also gives the impression of a slightly thicker dock, which helps a bit… the models in the game will be multi-tonne Warjacks, and I don’t want them stomping around on a flimsy bit of balsa wood. This is as far as I’ve gotten over the weekend. 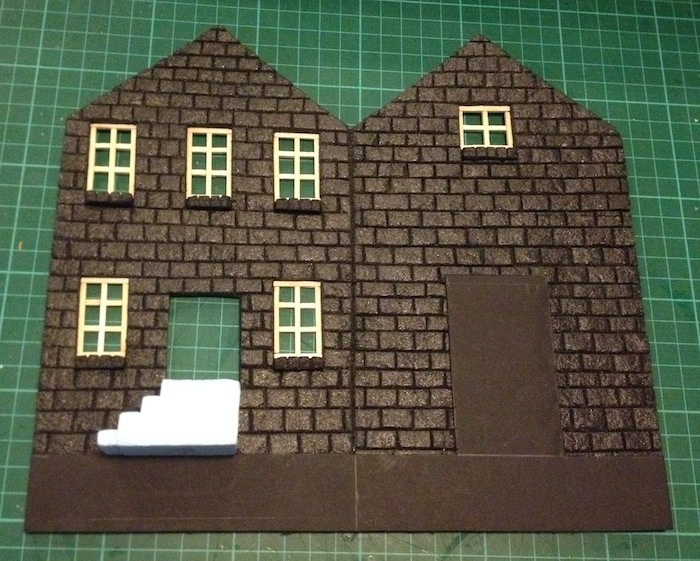 I needed to get a clearer image of just how big things will be, so I’ve used some foam offcuts to make a rough mockup of where the elevation changes happen. 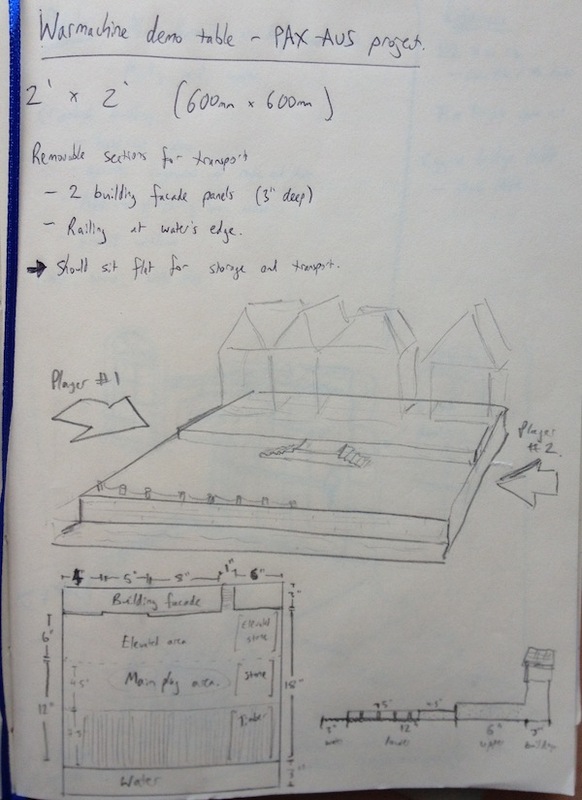 The design changed a bit after that last sketch, and I decided on a broad wooden dock for most of the low ground (as shown in the plan view on that image). That seems a bit more natural, but also requires a whole lot of wooden bits cut and glued in place. 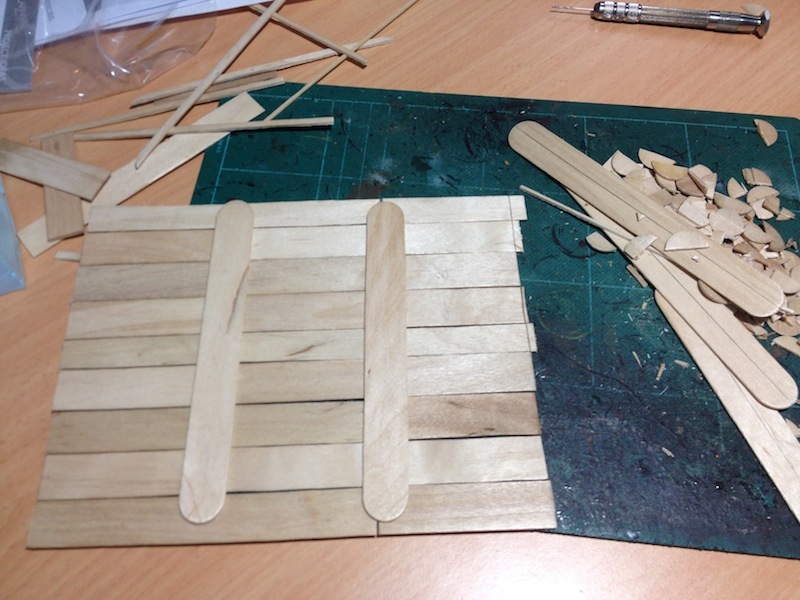 So, a trip to Riot happened, and I bought (and promptly hacked up) a packet of wooden craft sticks. Wider and thinner than icypole sticks; more like the kind of thing a doctor would use to help peer down your throat. They were easy enough to cut with a craft knife, scoring (both sides!) and snapping them across the grain – or just scoring them twice when cutting lengthwise. 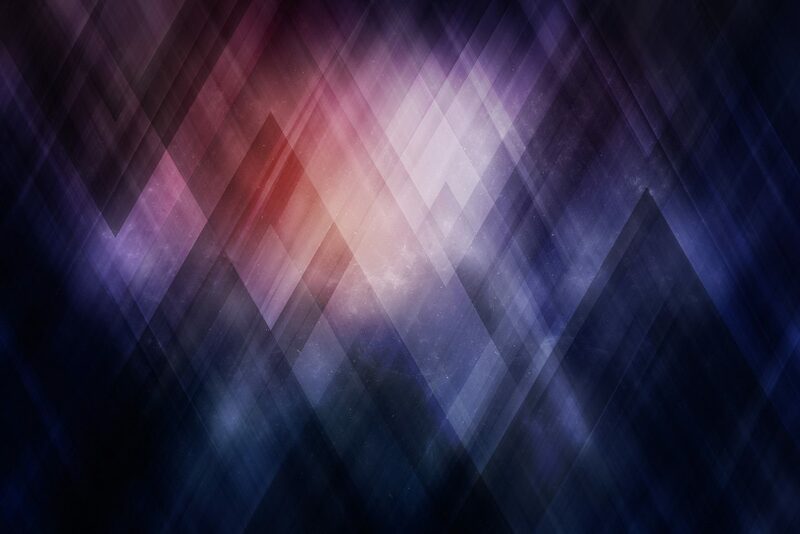 This shows the ends being cut off, and a few variant widths. 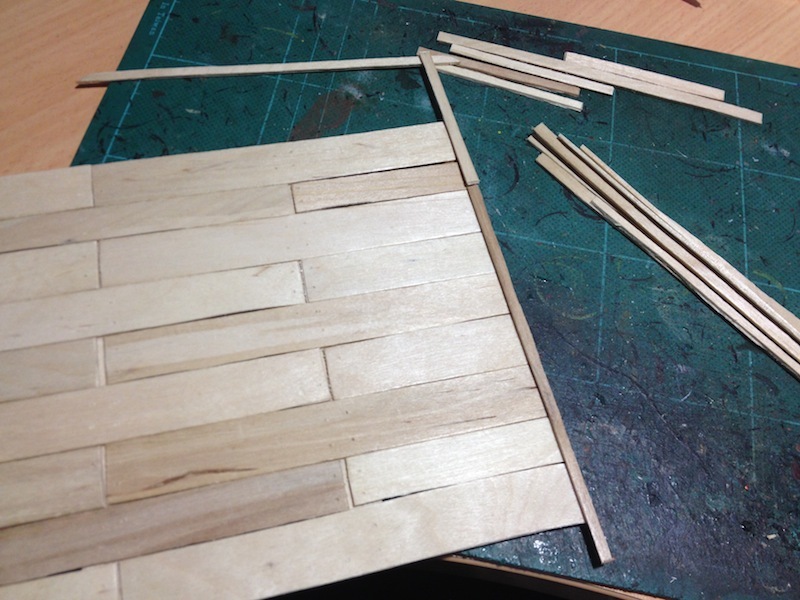 Having a few narrower planks helps to break up the monotony, and produces handy offcuts that I’ll use in a minute. 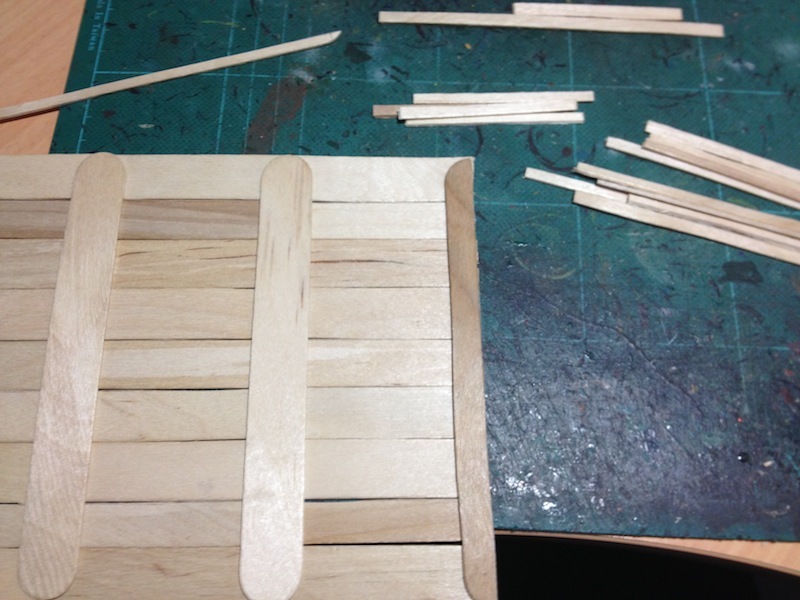 I then started gluing them down to a supporting framework. 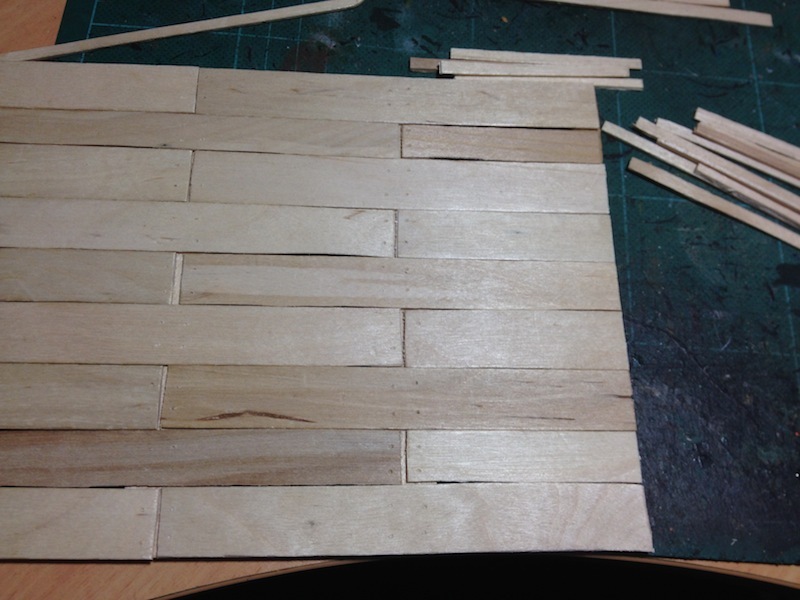 Some planks have been cut more-or-less in half – that gives the total length I needed, and lets me alternate short-long, long-short across the structure. Over the weekend it occurred to me that I need to find a way of storing this, as even a 2×2 board could be awkward to fit in a wardrobe if it has too much detail on it. 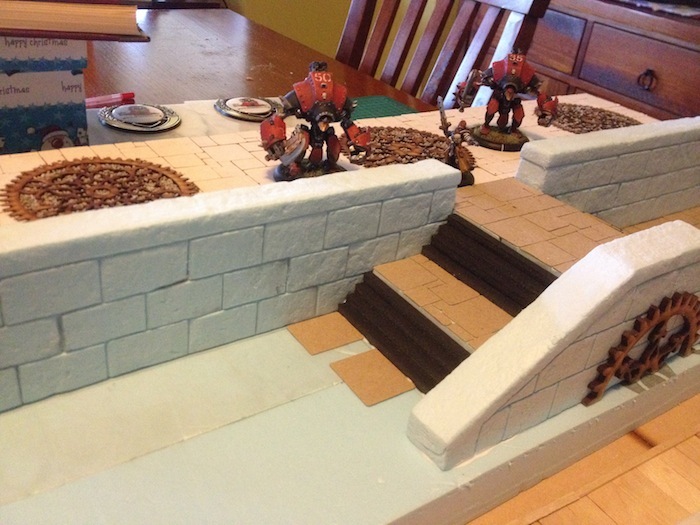 Then I remembered about Back 2 Base-ix and their modular terrain boards. I still want to glue most sections together so I can have a seamless stretch of water at the front, but I like the idea of potentially adding other pieces over time – so having magnets built into the frame is a great idea. 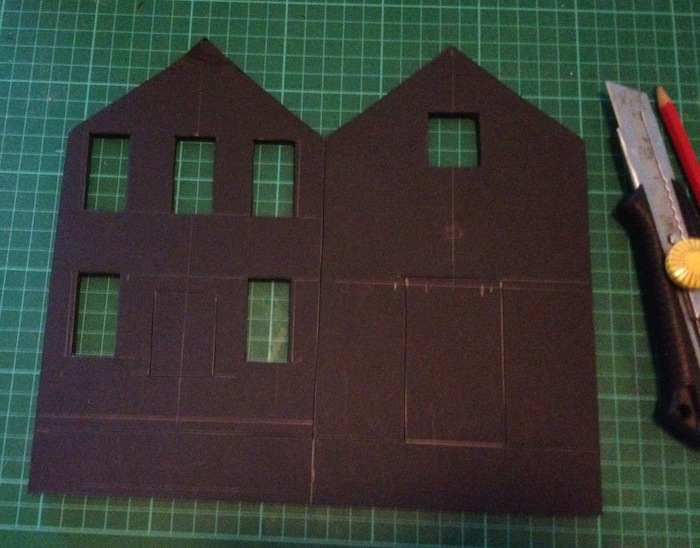 If I get really tricky, I could even magnetise some pieces of bevelled picture framing timber… that way the board could have a “finished” edge on it, removable when expansion is needed. I mucked around with graph paper trying to sort out 300×300, 300×100 and 150×150 shapes – the basic plan is to have two sections, each made of four boards glued together. 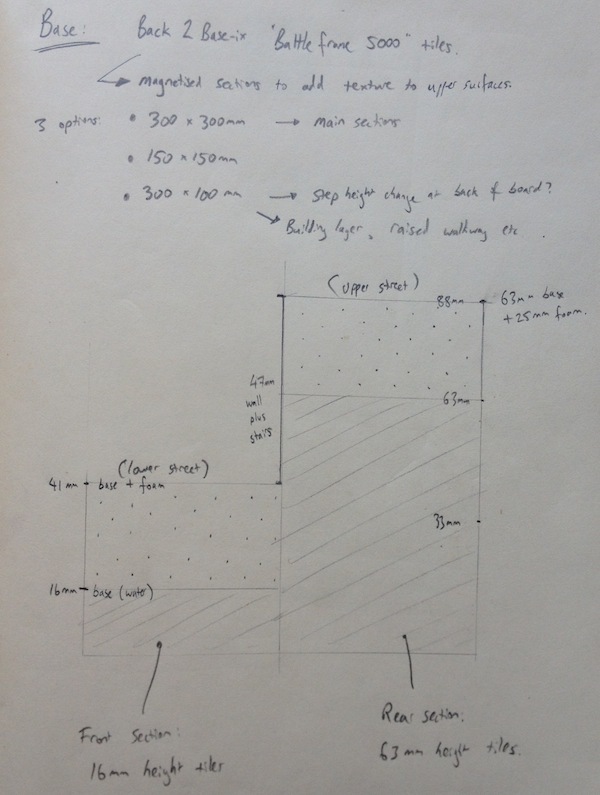 The front section (water, dock and low ground) will be 600mm x 400mm, built up from the 16mm base boards. The rear section will be 600mm x 200mm, built from a 63mm base. This will have an overhang at the front: both for the stone texture on that large retaining wall (shown above), and for the stairwell. The whole piece should sit neatly on the flat docks, and it’s narrow enough to fit on a high bookshelf without too much overhang. 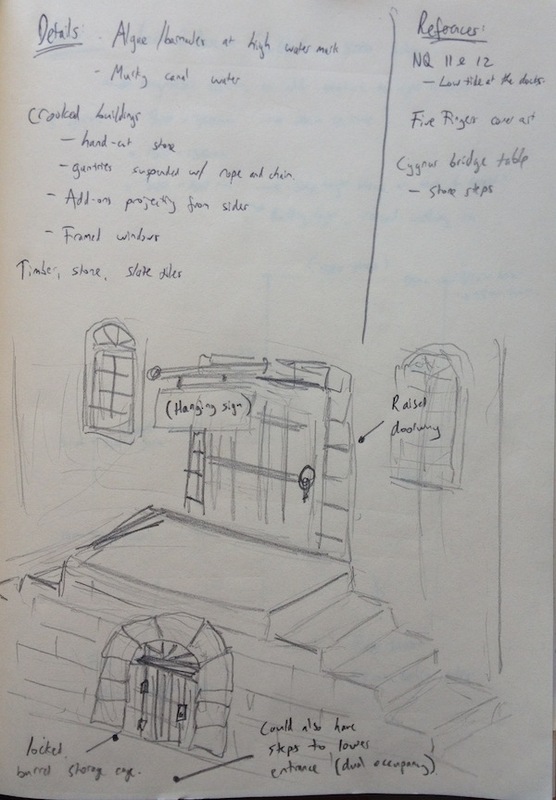 It’s early days yet on this project: a bunch of the parts I want are currently in transit, so I’ve started off by sketching out some ideas and planning it all out. 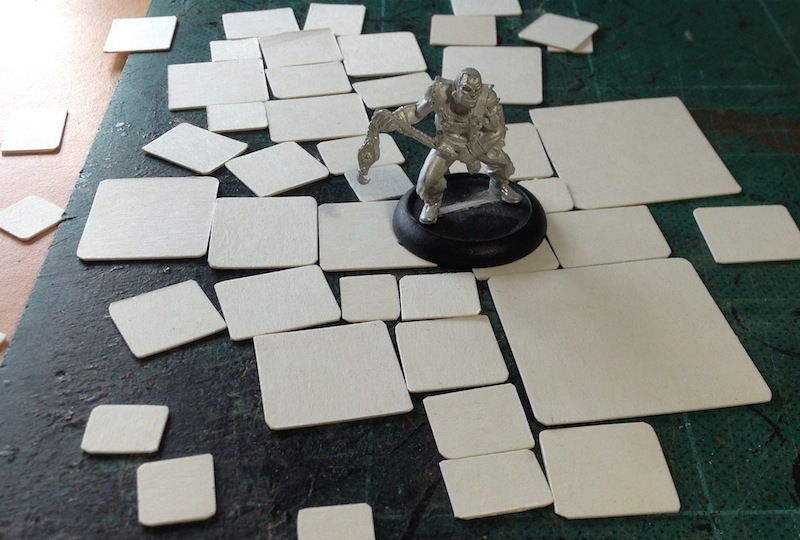 The table will be 2′ x 2′ to remove those early-game turns of running everyone forwards. That also conveniently reduces the surface area I’m working on, and lets me put more detail into it. 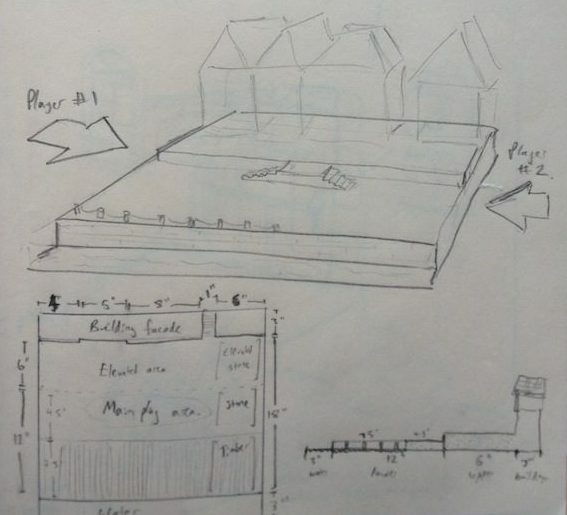 Next post will have some of the sketches – I’m still sorting out what it’ll look like, but I really like the idea of a tiered board that runs from a high city backdrop down to the water level. The buildings will sit at the back of the table (so the people running demo games can stand behind it), while the players will deploy opposite each other on the same level… playing left to right, or vice versa.